Majority of pharmacies and drugstores in Puerto Princesa City are yet to implement the exemption of diabetes, hypertension, and high cholesterol prescription drugs from value-added tax (VAT) due to the absence of specific pricing system guidelines. Helma Callaben, a pharmacist of the city-based Drugman Drughouse, said Wednesday they are more than willing to implement the government’s VAT exemption order on medicines for diabetes and cardiovascular diseases but they could not do so immediately since they need to make adjustments in their pricing system. She said they are also waiting to receive the guidelines regarding prices and if it is their company or the Bureau of Internal Revenue (BIR) that will make the adjustments. Callaben said as soon as these issues have been cleared they will distribute the lists of all VAT-exempted medicines in all their branches. “Wala kasi kaming natanggap na guidelines and we were advised by the supplier na maghintay muna. Pero since nakapag-print na rin kami ng list, hopefully by next week maiikakalat na namin ‘yong price list sa iba pang branch namin,” Callaben said. Other small drugstores and pharmacies also share Callaben’s explanation but expressed willingness to comply with the law. For national drugstores like Mercury Drugs, Generics Pharmacy, and Generika, the mandate was immediately implemented on January 1 because of centralized systems that instantly update the prices of VAT-free drugs. “Automatic na ‘yon kasi na-update na sa system sa main office so kapag may bibili ng gamot at kasama sa list ng VAT-free medicines, ‘yon na ‘yong lalabas na prices (It’s automatic because our system was updated in our main office, so if anyone buys medicines that are VAT-free, the new prices will be the one that will appear),” said Nancy Soto, branch manager of Mercury Drug along Malvar Street. 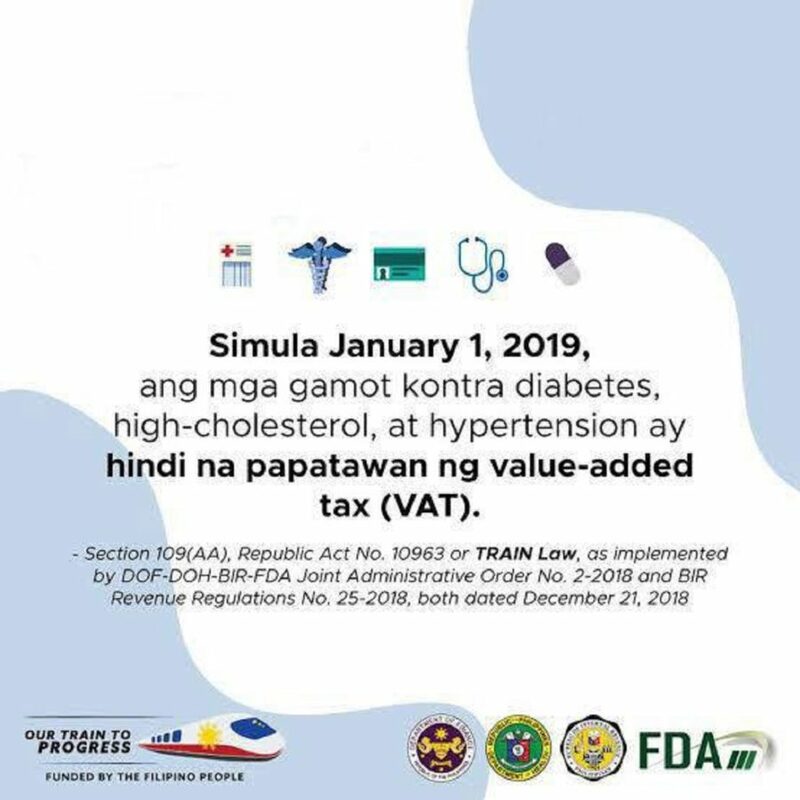 Last week, Health Secretary Francisco Duque III reminded pharmacies and drugstores nationwide to comply with the 12 percent VAT exemption on the sale of prescribed drugs to treat diabetes, hypertension, and high cholesterol as mandated by Republic Act 10963 or the “Tax Reform for Acceleration and Inclusion Act (TRAIN) law” effective January 1. The tax exemption applies to over 600 maintenance medicines, he said, and its implementation will be closely monitored by the Department of Health (DOH) and its attached agencies, including the Food and Drug Administration (FDA). Duque said non-compliance of the mandate can cause drugstores and pharmacies problems since they can be held accountable for violation. Anyone can access the list of these medicines at https://dpw.doh.gov.ph/VATExempted as posted by the Department of Finance (DOF).